LEN - www.lankaenews.com | The havoc war wreaked on lives..! Emotional reunion after 18 years : Husband finally traces his wife and son.! The havoc war wreaked on lives..! Emotional reunion after 18 years : Husband finally traces his wife and son.! 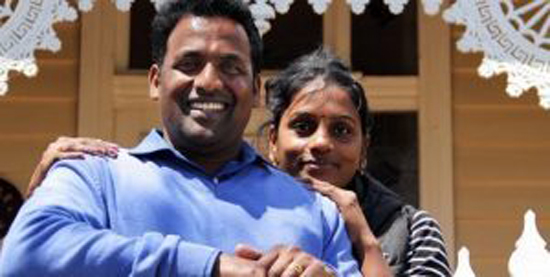 (Lanka-e-News- 29.Dec.2017, 11.45PM) After 18 long years a resident of Jaffna had been able to trace missing his wife and child , and had met them in Australia on the 27 th. P. Bahitharan, 7 years after his marriage was abducted by some LTTE cadres and forcibly made a member of that organization. During the final phase of the war after being with the LTTE he surrendered to the armed forces. Later , under the government’s rehabilitation program , he was released following rehabilitation . Bahitharan since the day he was released had been visiting various areas making a desperate search of his wife and child without avail. However , one day after seeing a woman on an Australian television program resembling his wife , he had furnished all details to a friend of his in Australia . Finally ,Bahitharan was able to trace his wife based on the information he obtained from the TV channel. Many had told his wife that Bahitharan died during the war. After her husband spoke to her on the phone , their attempts to meet each other had proved futile .On two occasions Bahitharan tried to leave for Australia by boat expending large sums of money . However those attempts were unsuccessful. Finally , after his friend took Bahitharan’s wife and child to the Australian TV channel and explained to them of the family’s sorrowful separation , Bahitharan secured the opportunity to travel to Australia for a most emotional family reunion. Herein is a photograph of Bahitharan with his wife posing gleefully taken a few days after his marriage.